To serve with the curry I made, I decided to try making basmati rice with my donabe rice cooker, "Kamado-san". 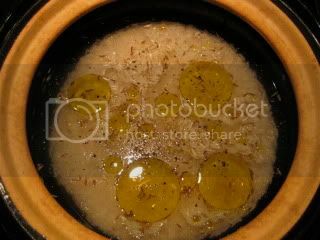 In the donabe, I combined 2 cups (regular US measurement) of unwashed basmati rice, 3 cups minus 2 tablespoons of water, 2 tablespoons of olive oil, and 2 teaspoons of cumin seeds. So, basically the ratio is 1 part rice: 1.5 part liquid. 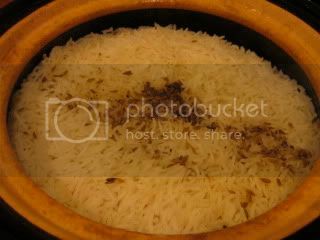 Since basmati rice doesn't normally require soaking, after covering the donabe with both lids, I just set it over medium-high heat and cooked for 15 minutes. After turning off the heat, the rice was let rest (covered) for 20 minutes. My first donabe basmati rice was a success! The aroma was very nice and the texture was so fluffy and delicate. It was so wonderful with the curry. 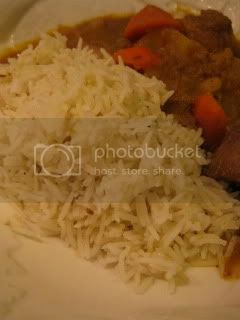 I will write about the curry recipe in the next posting.